Umbilical cord blood is the blood found in the vessels of the umbilical cord and placenta. It has been shown that this blood contains at least three populations of stem cells, each with unique features and properties. Due to the absence of standardized criteria for characterizing and naming cord blood stem cells, different terms and acronyms have been introduced to describe certain cell populations. Besides the confusion caused by the introduction of these different names, some of the terms used by different groups are inaccurate and misleading when considering the molecular and cellular properties of such cells. Hence, in this review we provide simple and direct descriptions of different populations of stem cells in umbilical cord blood in an attempt to clarify the confusion caused by the existence of multiple names given to certain cord blood stem cells. We also discuss the potential use of umbilical cord blood stem cells as a therapeutic tool for several diseases and disorders in light of ongoing clinical trials. The umbilical cord blood is regarded as the “life line” that supplies the developing fetus with the important nutrition elements and oxygen required for proper fetal development. Beside its role in development, umbilical cord blood has been also involved in therapeutic applications, which was reported for the first time in 1972 by clinicians in the United States to treat a case with lymphoblastic leukemia . In later years, it was used regularly for transplantation in hematology for bone marrow replacement, following either hematological malignancy or bone marrow failure after chemotherapy. Umbilical cord blood use was then restricted to blood-proliferation-based diseases [2,3]. Nevertheless, advances in the production of different tissue groups from umbilical cord blood stem cells, from the three germ layers, has highlighted the additional potential of umbilical cord blood in treatment of other pathological disorders and medical applications including regenerative medicine and tissue engineering [4-6]. Umbilical cord blood contains a highly heterogeneous mixture of cells. This mixture includes hematopoietic cells including erythrocytes and leukocytes. Moreover, umbilical cord blood contains at least three types of stem cells including a population of hematopoietic stem cells (HSCs) and a population of Mesenchymal stem cells (MSCs), which are a multipotent stem cells highly similar to Mesenchymal stem cells (MSCs) of the bone marrow [7,8]. In addition, umbilical cord blood, contains a relatively low concentration of non-hematopoietic multipotent stem cells expressing SSEA-4 protein, a surface marker expressed by embryonic stem cells [9,10], and the transcription factors OCT4, SOX2 and NANOG normally expressed by pluripotent stem cells [10-12]. The potential use of this non-hematopoietic stem cell population in a range of applications underpins the efforts to further characterize and analyze the properties of this unique cell population. Nevertheless, the absence of standardized criteria for characterizing and naming this unique population of cells resulted in the introduction of different names and acronyms for these cells. Such acronyms may have sometimes lead to inaccurate and misleading classification, especially in relation to other types of stem cells. Here, we describe the different types of stem cells that exist in the umbilical cord blood/placenta to ease the misconception and confusion surrounding umbilical cord blood stem cells. Also, we reflect on the advantages of utilizing umbilical cord blood over other sources of stem cells and explore the potential uses of these cells as a therapeutic tool for treating different diseases and disorders. 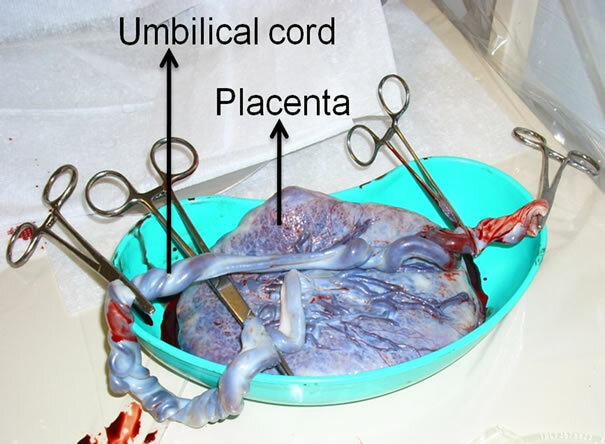 The umbilical cord is the cord that connects the developing fetus to the placenta. The umbilical cord originates from the same zygote as the fetus. It develops from the yolk sac and allantois by the 5th week of fetal development and replaces the yolk sac as the nutrient supplier for the fetus . The umbilical cord averages 50 - 60 cm in length and about 2 cm in diameter at the end of gestation (Figure 1) . It contains three blood vessels, one vein and two arteries, which coil around the vein in a helical configuration . The vein supplies the fetus with nutrient-rich oxygenated blood from the placenta and the arteries takes the nutrient-depleted deoxygenated blood back to the placenta. The three blood vessels are insulated with a gelatinous substance called Wharton’s jelly that protects these vessels and prevents their compression . The umbilical cord is connected to the fetus at the abdominal area at the point, which after birth becomes the umbilicus. Once inside the fetus, the vein of the umbilical cord splits into two branches, one joins the hepatic portal vein, which directs blood to the liver and the second allows the majority of blood to bypass the liver and directs it to the fetal heart via the left hepatic vein and inferior vena cava. The umbilical cord arteries branch from the fetal internal iliac artery, which is the main artery in the pelvic area . The placenta is the organ that connects the developing fetus via the umbilical cord to the maternal uterine wall carrying out nutritive, respiratory, and excretory functions . Similar to the umbilical cord, the placenta originate from the same zygote as the fetus. It begins to develop during implantation of the blastocyst into the maternal endometrium and grows throughout pregnancy . Anatomically, the placenta has a dark maroon color and round flat appearance. It averages around 20 cm in diameter and 2.5 cm in thickness at the end of gestation (Figure 1). Figure 1. Human placenta and umbilical cord before cord blood collection. Photograph taken minutes after delivery. The placenta is divided into two portions, the fetal portion and the maternal portion. The fetal portion consists of the chorionic villi, which are villi that merge from the chorion to maximize the contact area with maternal blood. The maternal portion contains the intervillous space, which is the space between the fetal chorionic villi and maternal blood vessels. The delicate walls of the chorionic villi allow the fetal blood to absorb nutrients and oxygen from the maternal blood and discard waste products into it without intermigration of the two blood currents [18,19]. The increasing interest in umbilical cord blood emanated from its utilization in hematological applications in the past couple of decades. Previous and current clinical efforts, focused on analyzing and characterizing the constituents of umbilical cord blood. Beside the blood cells, that include erythrocytes, leukocytes and thrombocytes, the umbilical cord blood was found to contain different populations of stem cells, a unique feature not shared with peripheral blood. Scientists and researchers have characterized the following stem cell populations from umbilical cord blood; hematopoietic stem cells (HSCs), multipotent non-hematopoietic stem cells and Mesenchymal stem cells (MSCs) (Figure 2). Haematopoiesis is the process by which blood cells are formed. All blood cellular components are derived from a multipotent stem cell population called hematopoietic stem cells through a series of complex proliferation and differentiation events . Umbilical cord blood has been shown to contain a population of hematopoietic stem cells (HSCs) at different stages of hematopoietic commitment, characterized by their differential expression of hematopoietic antigens CD133, CD34 and CD45 according to a model previously described [21,22]. It has been shown that cord blood hematopoietic stem cells can be selectively induced into specific hematopoietic lineages in-vitro including erythroid, megakaryocytic and monocytic lineages . Figure 2. Umbilical cord blood contains at least three populations of stem cells. Each has its unique molecular and cellular properties. Mesenchymal stem cells (MSCs), are a multipotent stem cell population found originally in the bone marrow [7,8]. These cells have the inherent ability of differentiating into osteogenic, adipogenic and chondrogenic lineages as well as non-mesodermal lineages including neural and hepatic lineages [8,24-26]. MSCs have been also isolated from umbilical cord blood [27-29]. Umbilical cord blood derived MSCs show high morphological and molecular similarities to bone marrow derived MSCs including the lacking of hematopoietic surface antigens CD133, CD34 and CD45 [27,29-31]. Although the isolation of MSCs from umbilical cord blood has been shown to be laborious because of their low number, compared to the bone marrow, cord blood derived MSCs demonstrate higher proliferation capabilities than bone marrow MSCs . Cord blood MSCs have been successfully differentiated in-vitro into osteogenic, chondrogenic, neural and hepatic lineages [32-35]. A unique population of multipotent non-hematopoietic stem cells has been identified in umbilical cord blood. These stem cells are small in size and exist at low density in cord blood and are negative for the major hematopoietic marker CD45 [9,10,36,37]. This population of cells has been shown to express transcription factors normally expressed by embryonic stem cells including pluripotency key players OCT4, SOX2 and NANOG. In addition, they expressed specific surface markers, which have been used previously to characterize human embryonic stem cell lines. These markers include state-specific embryonic antigens, SSEA-3 and SSEA-4 in addition to tumor rejection antigens TRA1-60 and TRA1-80 [9,10,36,38,39]. These stem cells have been shown to differentiate into various cell types representing the three germ layers. Many groups have reported successful neural induction of cord blood stem cells representing ectodermal commitment [12,37,40,41], whilst other groups have successfully differentiated cord blood naïve stem cells into endodermic lineages including hepatic and pancreatic cells [5,9], and other groups have reported the successful generation of endothelial cells from cord blood naive stem cells representing the mesodermal lineage [42,43]. Research groups have developed different strategies in attempts to purify cord blood non-hematopoietic stem cells population (Table 1). For example, Buzanska et al. (2002) developed an immunomagnetic sorting strategy to purify the targeted population. They utilized magnetic beads that can specifically recognize CD34, a surface antigen expressed by hematopoietic stem cells (HSCs), and depleted the CD34-postive cells . The purified CD34-negative cell fraction was reported to express OCT4 and SOX2 [41,45,46]. Forraz et al. (2004), utilized the same immunomagnetic depletion strategy used by Buzanska’s group but instead of using a single antibody, they used a combination of hematopoietic antibodies including CD45, CD235a, CD38, CD7, CD33, CD56, CD16, CD3, and CD2 in a sequential manner to purify the targeted population, which were reported to make up around 0.1% of the total mononuclear fraction of the cord blood [9,47,48]. Other groups utilized multi-parameter fluorescence-activated cell sorting (FACS) to purify the targeted population. They used a cocktail of antibodies including hematopoietic stem cell markers CD 133, CD34 and the general hematopoietic marker CD45. The CD45-positive cells were eliminated and at the same time the CD133 and CD 34 positive cells were enriched using FACS sorting. Those enriched cells expressed OCT4 and NANOG in addition to surface embryonic marker SSEA-4 [10,49] (Table 1). Table 1. Reported purification and selection methods of umbilical cord blood non-hematopoietic stem cells. Due to such marker expression profile, McGuckin et al. (2005) named these cells cord blood derived embryonic-like stem cells (CBEs), while Kucia et al. (2007) named them very small embryonic-like stem cells (VS ELs). Other groups have also named them cord blood pluripotent stem cells [50,51]. Besides the confusion caused by the introduction of different names and acronyms for these cells (due to the absence of standardized biological/expression or other criteria) the use of terms such as “embryonic-like” and “pluripotent” terms to describe these cells might be inaccurate and misleading. The term “embryonic-like” was given to cells based on their expression of so-called embryonic stem cell markers such as OCT4, the main pluripotency key player in embryonic stem cells . It has been shown that OCT4 has multiple splice variants including OCT4A and OCT4B that differ only in their N terminals whilst having identical C terminals. The splice variants have been shown to have different temporal and spatial expression patterns. Whilst OCT4A was expressed mainly in the nuclei of human embryonic stem cells, OCT4B was detected in many different types of differentiated cells [53,54]. Consequently, McGuckin et al. (2005), Kucia et al. (2007) and Zhao et al. (2006) have all used OCT4 antibodies that were not specific for the OCT4A variant in their studies, and such antibodies have been shown to give positive results on mature hematopoietic cells isolated from adult human peripheral blood . Therefore, drawing conclusions based on such results could be inaccurate. On the other hand, using the term “pluripotent” to describe the differentiation potential of such cells based on the expression profiles of certain markers might not be appropriate even if the cells have been shown to differentiate into some but not all cell types representing the three germ layers. The reason for this is that cord blood stem cells do not form teratomas after transplantation in SCID mice, the current gold standard for determining the pluripotency of human cell lines. Therefore, these stem cells do not satisfy the current criteria for defining them as pluripotent stem cells . Hence to avoid confusion, we suggest naming these cells “non-hematopoietic multipotent stem cells”, which defines their differentiation potential and distinguishes them from cord blood hematopoietic stem cells. Such terminology would avoid the inappropriate linking between these cells and embryonic stem cells and better describes their cell biology. There has been great debate on the stem cell source of choice for research and clinical applications. Each type of stem cells (embryonic, cord blood, adult) has its advantages and drawbacks when considered for potential clinical applications. Umbilical cord blood offers an alternative source of stem cells with both research and clinical advantages over other sources of stem cells. Moving toward effective clinical applications requires a readily abundant supply of stem cells to provide the needed amounts of stem cells. With the global birth rate exceeding 140 millions/year, umbilical cord blood can be considered as one of the most abundant sources of stem cells (World health statistics 2011, World Health Organization). In addition, unlike embryonic stem cells, umbilical cord blood stem cells collection is not associated with complicated ethical, religious or political concerns, which makes them more appealing to use in the clinical practice [4,57]. Umbilical cord blood stem cells also show a number of advantages over adult stem cells sources like bone marrow. In addition to the non-invasive collection procedure, umbilical cord blood stem cells show higher proliferating potential and longer telomeres than other adult stem cells [58-60]. Allogenic transplantation with adult HSCs is regarded as a life-saving procedure in the treatment of severe hematological diseases such as hematopoietic malignancies, bone marrow failure syndromes and hereditary immunodeficiency disorders . Yet, this procedure is limited by the availability of suitable HLA-matched donors . Due to the immature HLA status of umbilical cord blood cells, transplantation with cord blood shows better tolerance for HLA-mismatching in comparison with adults HSCs . This unique feature of cord blood allows the safe use of unrelated and HLA-mismatched donor samples when HLA-identical donors are not available, thus providing the clinicians with alternative effective therapeutic options [3,64]. Furthermore, transplantation with HLA-mismatched cord blood samples shows a lower risk of graft-versus-host diseases (GvHD) in comparison with bone marrow transplantation. This is also attributed to the fact that the cells transplanted from umbilical cord blood are more naïve and have lower (HLA) protein expression than adults stem cells including bone marrow stem cells [59,64-66]. In addition, umbilical cord blood transplantation was shown to be associated with a lower risk of infection transmission in comparison with bone marrow transplantation . On the other hand, the low number of stem cells per cord blood unit represents a limitation that is associated with delayed engraftment of these cells into host targeted tissues [62,68]. However, this obstacle has been tackled with the possibility of combining multiple cord blood units in order to increase the final transplanted cell dose resulting in improved engraftment and survival of the transplanted cells [3,61,64,68]. Umbilical cord blood has added advantages over other sources of stem cells. This highlights its potential as the stem cell type of choice for potential treatments of many diseases and disorders for which current form of treatment is inadequate (Table 2). Table 2. Summary of advantages and disadvantages of different stem cell sources. Table 3. Currently active clinical trials using umbilical cord blood to treat different diseases and conditions. Clinical applications of umbilical cord blood date back to the early 1970s, where it was used to treat lymphoblastic leukemia patients . Since then, it was used regularly in hematology transplantations as a replacement for bone marrow following hematological malignancy or bone marrow failure [2,3]. The discovery of the unique non-hematopoietic multipotent stem cells in cord blood and the ability to differentiate these cells into many different cell types highlighted the potential use of umbilical cord blood as a therapeutic tool for a wider range of diseases and disorders. Umbilical cord blood has already been utilized in a number of clinical trials aimed to treat certain neurological diseases including hypoxic-ischemic encephalopathy and spastic cerebral palsy, several media reports have indicated remarkable improvements in kids treated but official reports are yet to be published. In another currently active trial, umbilical cord blood is being utilized to treat people with spinal cord injuries. Umbilical cord blood is also currently involved in clinical trials treating different hematological conditions, inborn errors of metabolism, diabetes and heart disorders (Table 3). Clinical trials are still at its early stages but early indications suggest high potential and hope toward developing effective therapies for the disorders and injuries using umbilical cord blood. Umbilical cord blood can be viewed as a promising source of stem cells for research and clinical applications. It is ethically sound, its abundant supply, immunological immaturity and high plasticity makes it superior to other sources of stem cells. Umbilical cord blood contains at least three different populations of stem cells including hematopoietic stem cells (HSCs), Mesenchymal stem cells (MSCs) and a unique population of non-hematopoietic multipotent stem cells. Supported by in-vitro and preclinical studies, umbilical cord blood has been utilized in many different clinical trials aiming to treat a wide range of diseases and disorders. Although still at early stages, preliminary results from these clinical trials demonstrated high potential and hope toward developing effective therapies for various diseases and disorders for which current mode of therapy is inadequate. We would like to thank Professor Susan Lindsay and Dr Sajjad Ahmad from Institute of Genetic Medicine in University of Newcastle for their support and help. Ende, M. and Ende, N. (1972) Hematopoietic transplantation by means of fetal (cord) blood: A new method. Virginia Medical Monthly 1918, 99, 276-280. Ali, H. and Bahbahani, H. (2010) Umbilical cord blood stem cells—Potential therapeutic tool for neural injuries and disorders. Acta Neurobiologiae Experimentalis, 70, 316-324. Ali, H., Jurga, M., Kurgonaite, K., Forraz, N. and McGuckin, C. (2009) Defined serum-free culturing conditions for neural tissue engineering of human cord blood stem cells. Acta Neurobiologiae Experimentalis, 69, 12-23. Muller-Sieburg, C.E., Cho, R.H., Thoman, M., Adkins, B. and Sieburg, H.B. (2002) Deterministic regulation of hematopoietic stem cell self-renewal and differentiation. Blood, 100, 1302-1309. Kang, X.Q., Zang, W.J., Bao, L.J., Li, D.L., Song, T.S., Xu, X.L. and Yu, X.J. (2005) Fibroblast growth factor-4 and hepatocyte growth factor induce differentiation of human umbilical cord blood-derived mesenchymal stem cells into hepatocytes. World Journal of Gastroenterology, 11, 7461-7465. Ali, H., Forraz, N., McGuckin, C.P., Jurga, M., Lindsay, S., Ip, B.K., Trevelyan, A., Basford, C., Habibollah, S., Ahmad, S., Clowry, G.J. and Bayatti, N. (2011) In vitro modelling of cortical neurogenesis by sequential induction of human umbilical cord blood stem cells. Stem Cell Review, 43, 215-227. Buzanska, L., Machaj, E.K., Zablocka, B., Pojda, Z. and Domanska-Janik, K. (2002) Human cord blood-derived cells attain neuronal and glial features in vitro. Journal of Cell Science, 115, 2131-2138. Sangeetha, V.M., Kale, V.P. and Limaye, L.S. (2010) Expansion of cord blood CD34 cells in presence of zVADfmk and zLLYfmk improved their in vitro functionality and in vivo engraftment in NOD/SCID mouse. PLoS One, 5, E12221. Tse, W. and Laughlin, M.J. (2005) Umbilical cord blood transplantation: A new alternative option. American Society of Hematology Education Program, 377-383.